Articles about "Sony Ericsson Xperia Arc Specs-with Android 2.3" in this website is free. Read our reviews for "Sony Ericsson Xperia Arc Specs-with Android 2.3", gadget price, specs, features and find more latest Electronic Gadget Reviews and News. 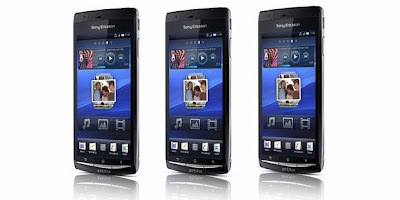 In accordance with his promise will carry a smartphone with the latest technology starting this year, Sony Ericsson introduced the Xperia Arc. Smartphone aimed at providing a multimedia experience this special use Android 2.3 platform, also known as Gingerbread. Xperia Arc is the first product of the latest generation smartphone Xperia, announced in 2011. Not only with the latest version of Android, smart phone is also supported by Sony's latest technologies that have been successfully used in other electronics products. "We started in 2011 with steady through Xperia product of our most exciting to date. Xperia Arc combines the latest technology from Sony with a stunning design to entertain and amaze consumers. All use the latest release of Android," said Djunadi Satrio, Head of Marketing Sony Ericsson Indonesia, in his press release today, Thursday (06/01/2011). The quality of the display on its screen technology backed by Sony Reality Display Mobile BRAVIA Engine which produces visually brilliant. 8.1 MP camera phone using the sensor with Exmor R f/2.4 lens from Sony, which has won awards for recording HD video. All images and videos can be displayed in HD on a TV monitor via a built in HDMI-connector. Xperia Arc comes with a super slim and lightweight design, with a thickness of 8.7 mm at the thinnest part and has a multi-touch screen 4.2 inches wide. Although slim, the material used to make them stay strong guaranteed tough. This product is available in Indonesia market started the first quarter of this year with a choice of colors midnight blue and misty silver.